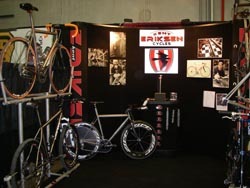 Kent Eriksen of Kent Eriksen Cycles was twice honored in one year at handmade bicycle shows. First recognized in February for the award of Best Titanium Bike at the North American Handmade Bicycle Show (NAHBS) and again in late August for the 2009 Builder of the Year title at the Rocky Mountain Bicycle Show in Denver. Eriksen received the awards based on peer recognition and selection at both events. "It's like a lifetime achievement award," says the 30 year veteran frame builder. Eriksen's enthusiasm was contagious at the latest award ceremony. He states: "I was completely surprised by the selection, there were several great builders at both shows and I am honored to earn this respect and recognition." Eriksen is no rookie to the bike building world. Founding the Moots brand over 28 years ago Eriksen was instrumental in frame design innovation, suspension technology and creative component development. His signature metal, titanium, lends itself well to this master craftsman. Shaped tubes, meticulous details, precise miters and coveted welds are hallmarks of his work earning him a place in the Mountain Bike Hall of Fame. Inspired after departing Moots in 2005 to develop his signature brand, Eriksen now focuses on the customer and their individual needs. The shop is filled with specialized tooling, jigs and machines all developed by Eriksen to allow his creative designs to thrive. "I want to appeal to all cyclists including mountain, road, casual and serious riders. Everyone deserves to ride great bikes made specifically for them," says Eriksen. "I value each frame created when I know the customer I am designing for and I especially enjoy the process of meeting folks and helping them with a lifetime design and purchase," Eriksen explains. Eriksen is quick to acknowledge his small shop staff is critical to keeping the business running smoothly. "Without my welder, finish guys and my wife to make the production complete, I would be struggling. No one gets here alone and I am privileged to be awarded these honors with the Eriksen Cycles crew."